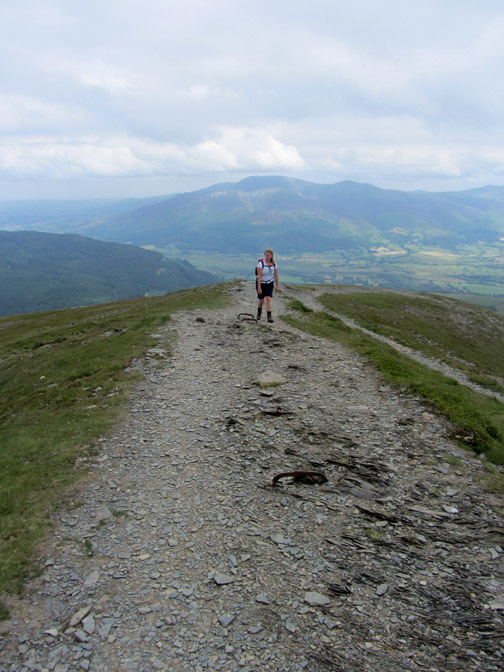 " Dale Head and Grisedale Pike with Jenna "
Date & start time: Monday / Tuesday 15th / 16th July 2013. 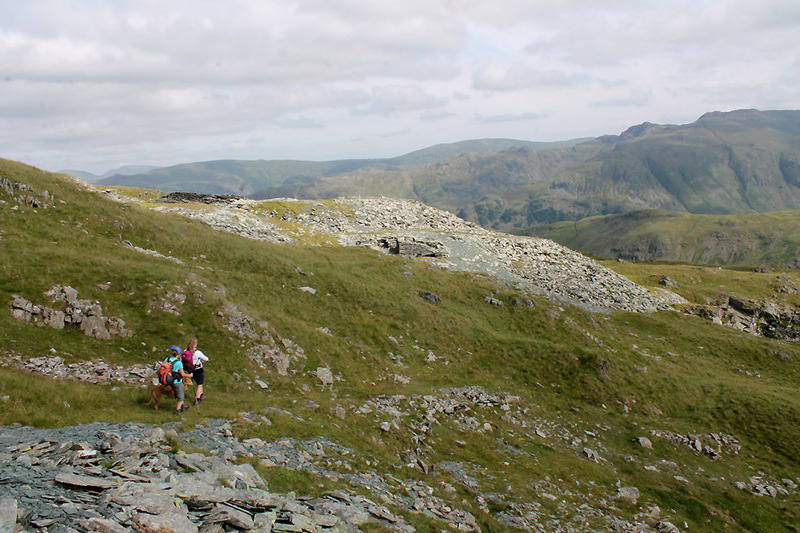 Places visited : Honister for Dale Head, Revlin Moss for Grisedale Pike. 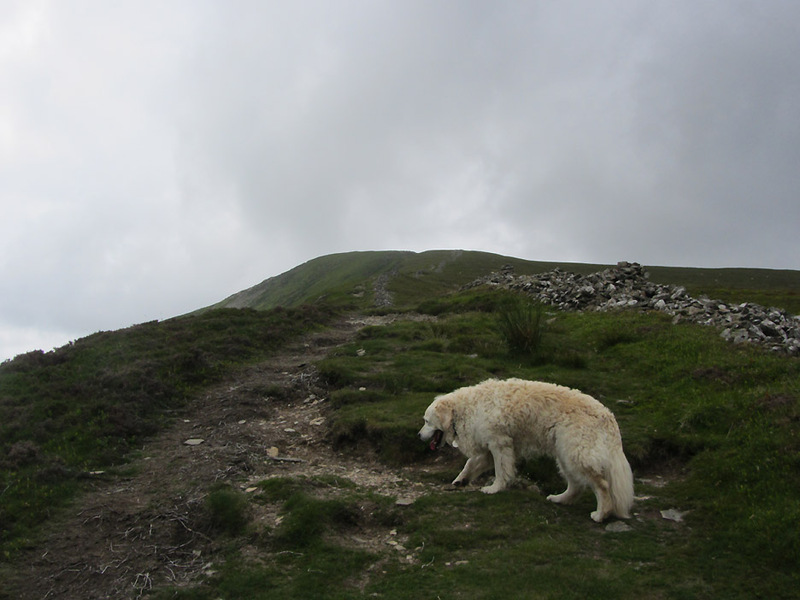 Walk details (1) : 2.75 mls, 1500 ft of ascent, 2 hours 30 mins. 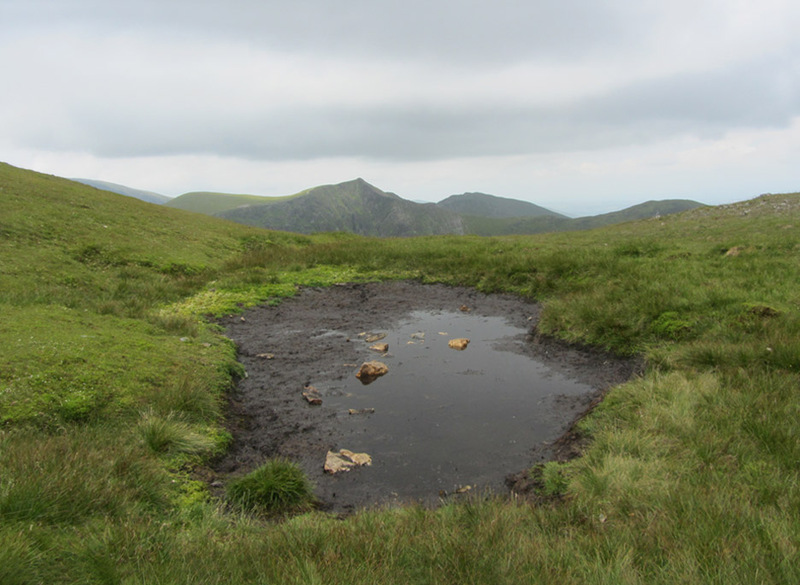 Walk details (2) : 3.5 mls, 1600 ft of ascent, 2 hours 20 mins. 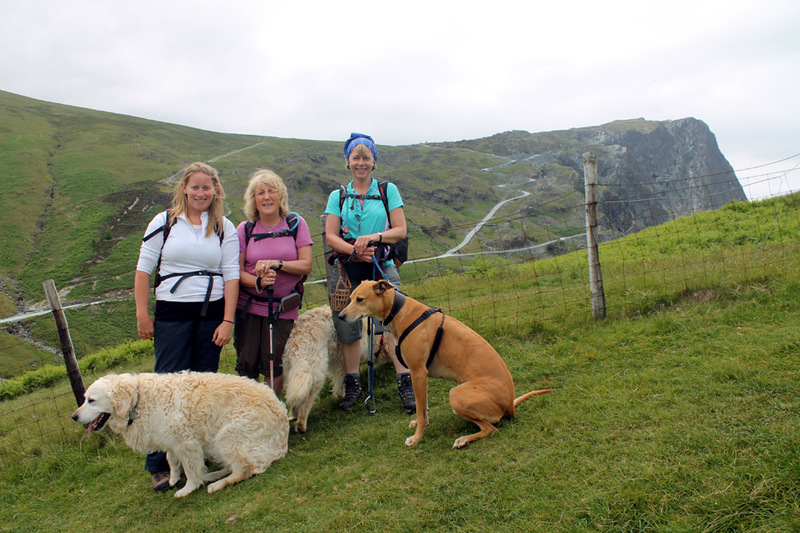 Walked with : Jenna, Jo, Ann and the dogs, Jodie, Harry and Bethan. Weather : Hot and sunny but with some overcast conditions this week. 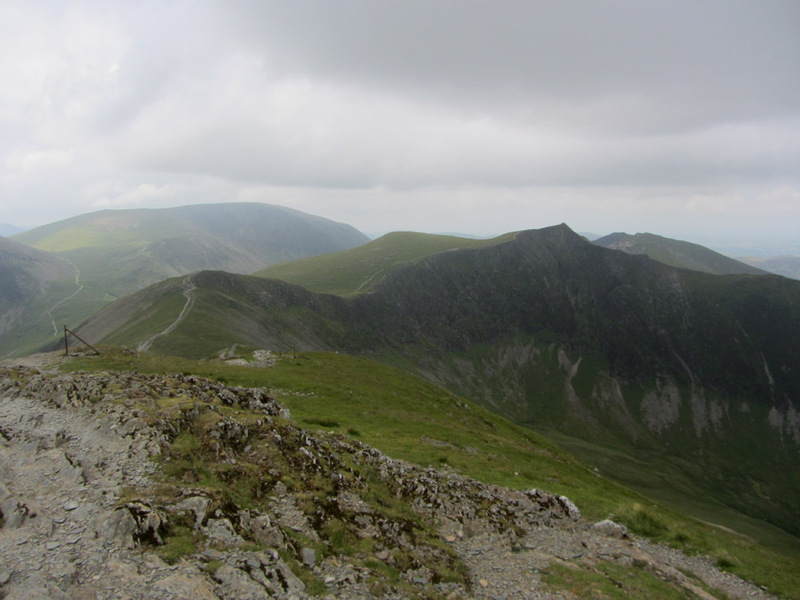 Our daughter is home for some of the summer and in this fine weather she asks to walk a couple of high fells. 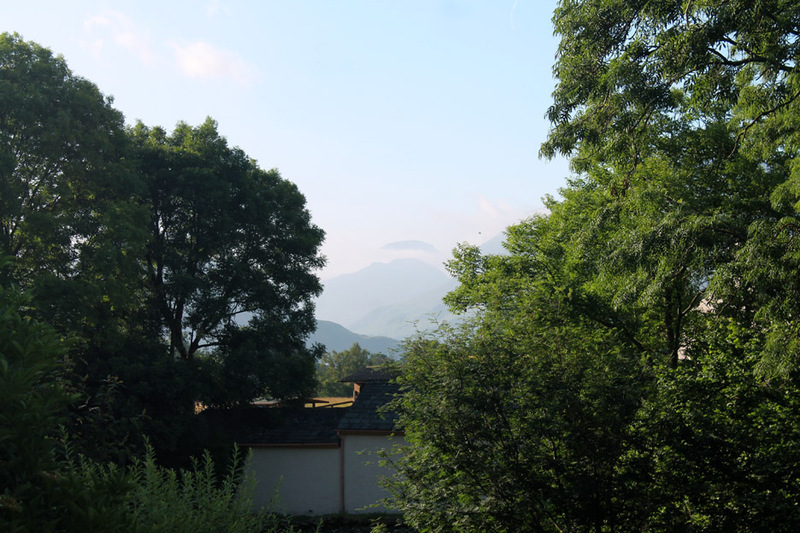 The first is chosen to get a view out of the valley and the second is actually out of the valley, but not too far. Let's get out and enjoy the fine weather. 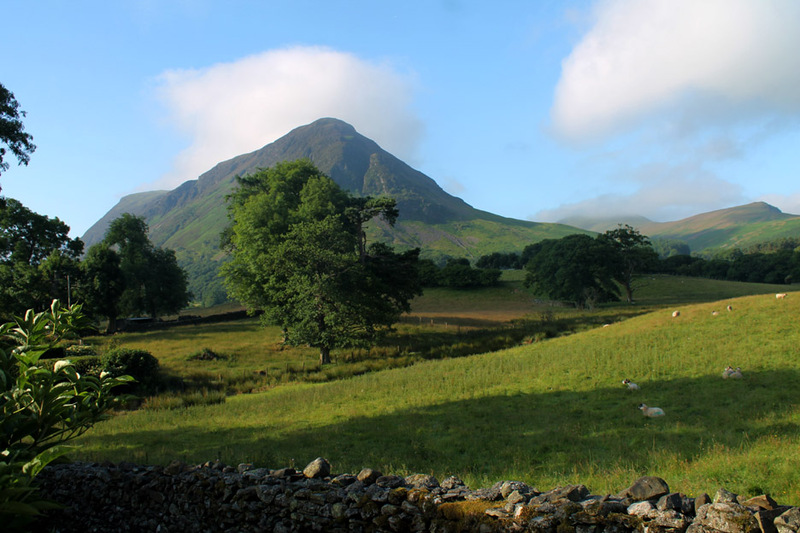 Eight o'clock and early morning mist is clearing from the fells. The prospect is for another fine day. 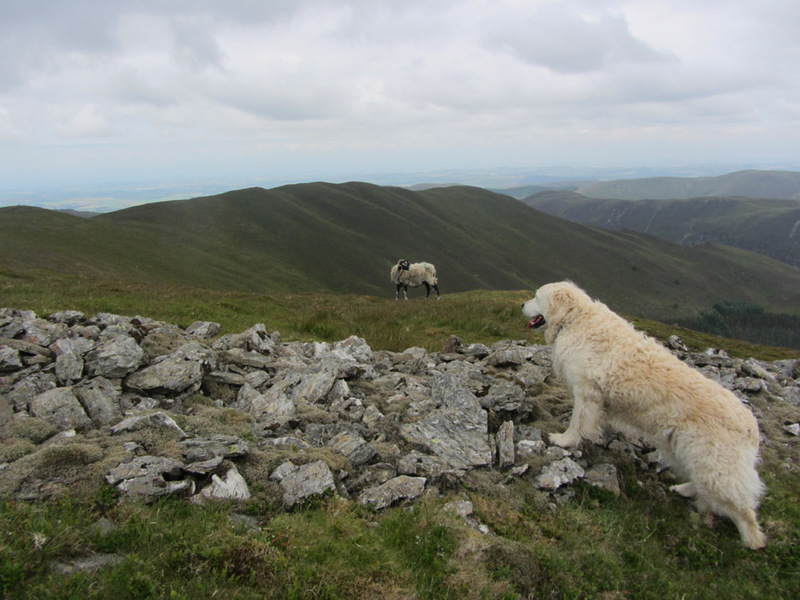 The light cloud has cleared Mellbreak but not quite the summit of Hen Comb. thereby enabling her to see "out of the valley". 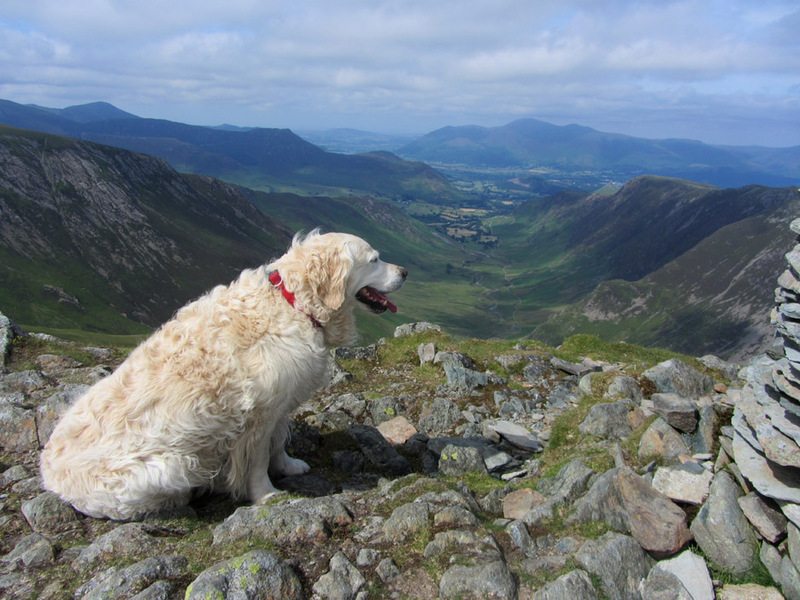 I think all her recent climbing here has been very localised and she fancied a different view. The usual team plus one . . . Jen, Ann and Jo. 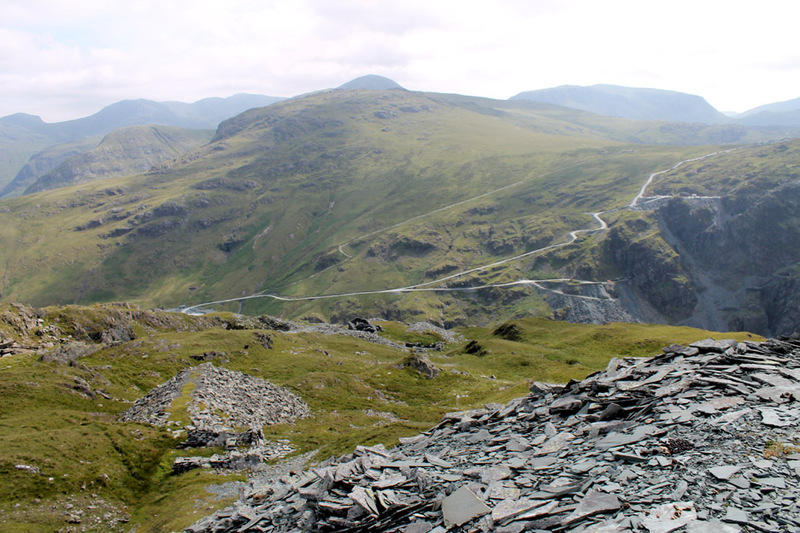 and the dry weather has slightly emphasised the mine road where the slate chippings have turned rather dusty. 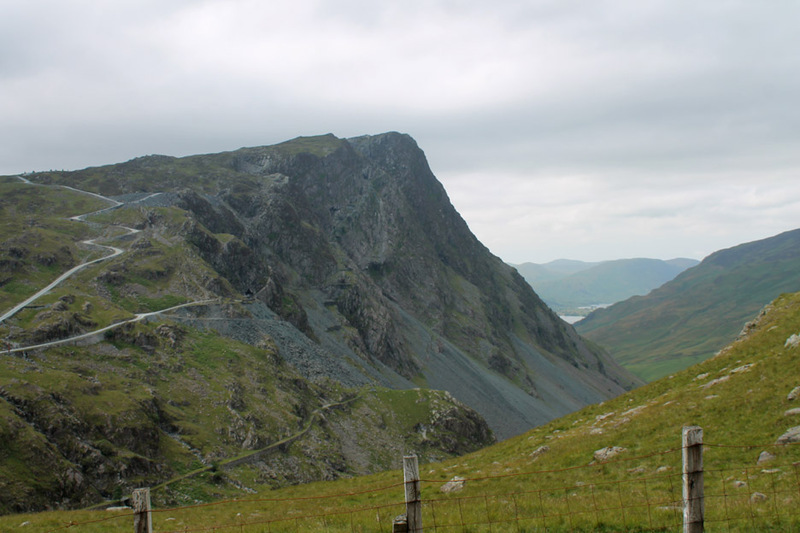 The Miners track across the front, now used as the "Via Ferrata", can be traced by following the black entrances diagonally up the crag. Jen's first view "out of the valley" today . 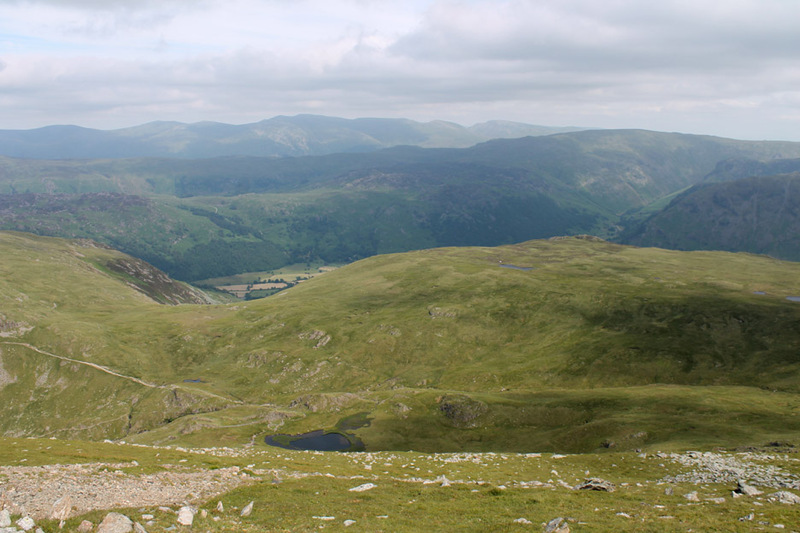 . . the Helvellyn Range beyond Launchy Tarn and the intermediate Watendlath fells. 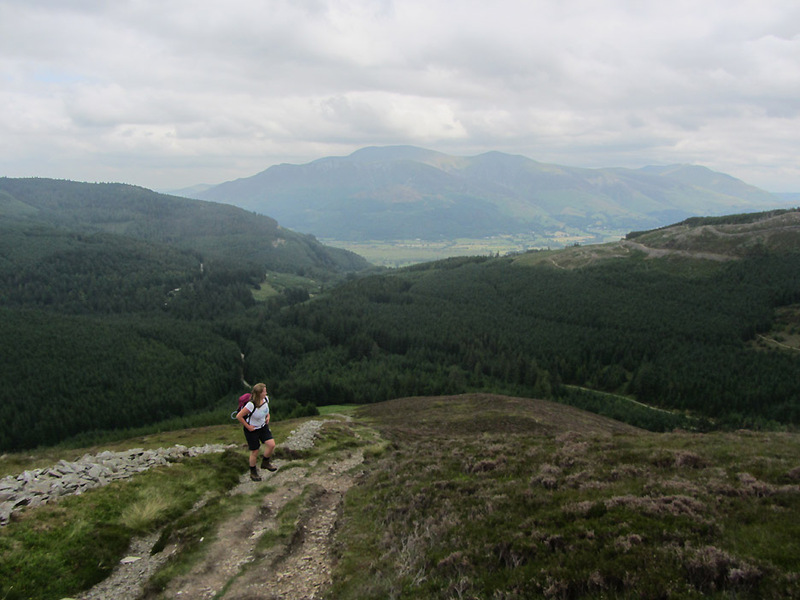 Bethan adds perspective to the view north east to High Spy, Maiden Moor and distant Skiddaw/Blencathra. 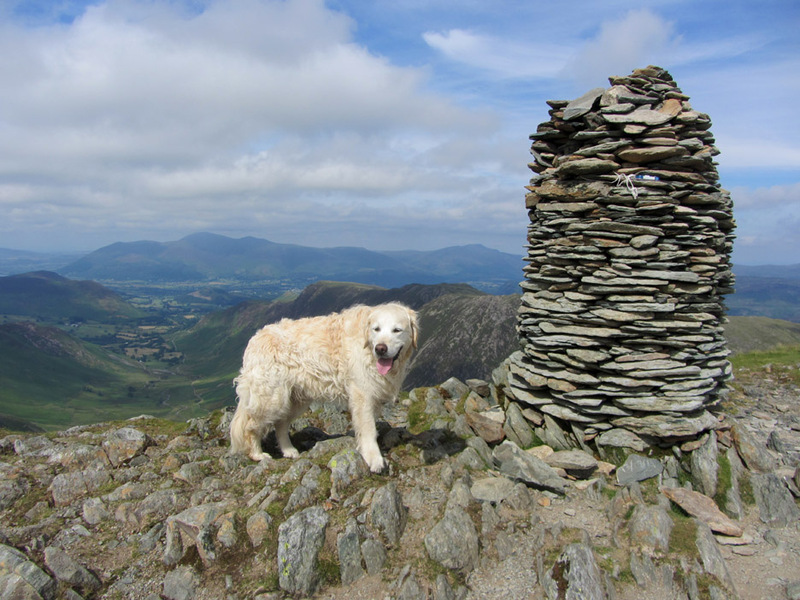 She (and we) have reached the dramatic summit of Dale Head. Navigation was easy . 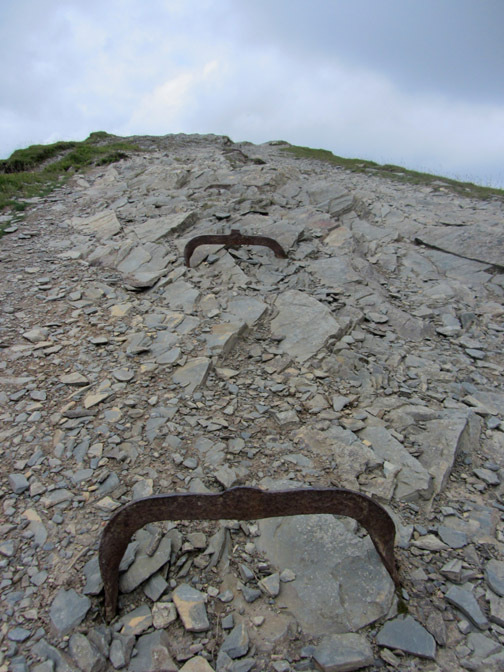 . . follow the old straight fence line to the top . . . just remember to stop before the sheer drop on the other side of the cairn. Good dog . . . listening for once ! on the left side of the 'U' shaped Newlands Valley. 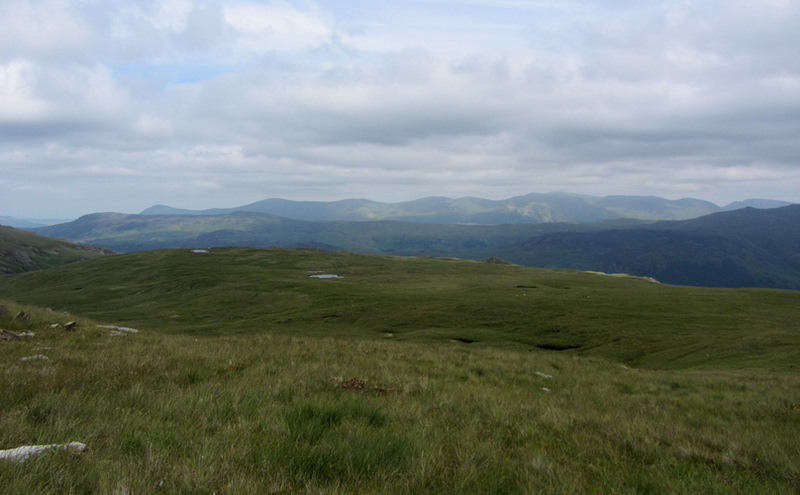 High Spy and Maiden Moor are on the right. 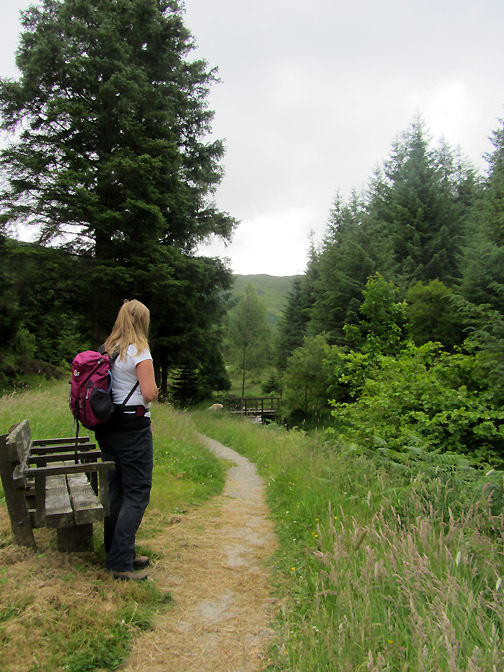 We traverse right to give Jen a view down past Dale Head Tarns and down to the fields of Borrowdale near Rosthwaite. 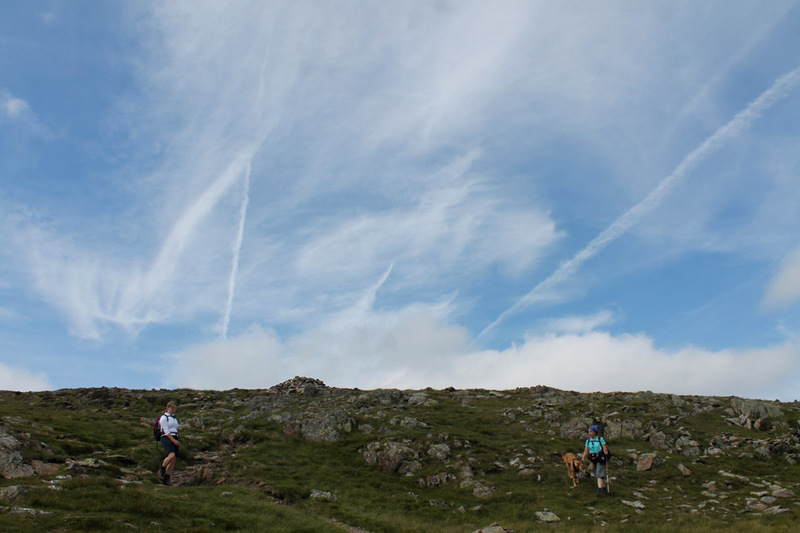 Big skies as we circle round and reach the main path down once again. 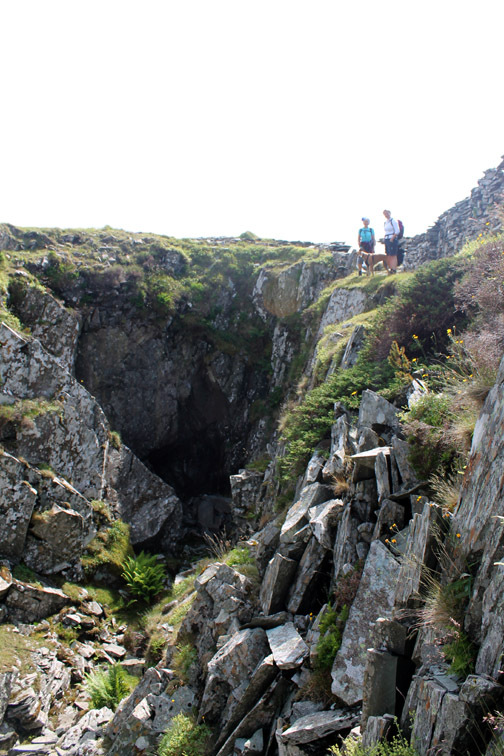 Rather than a direct descent, we chose to take a slight diversion to see some old mine workings. Looking down into one of the open slate caverns . . .
. . . and the reverse looking up from the same fern bush. 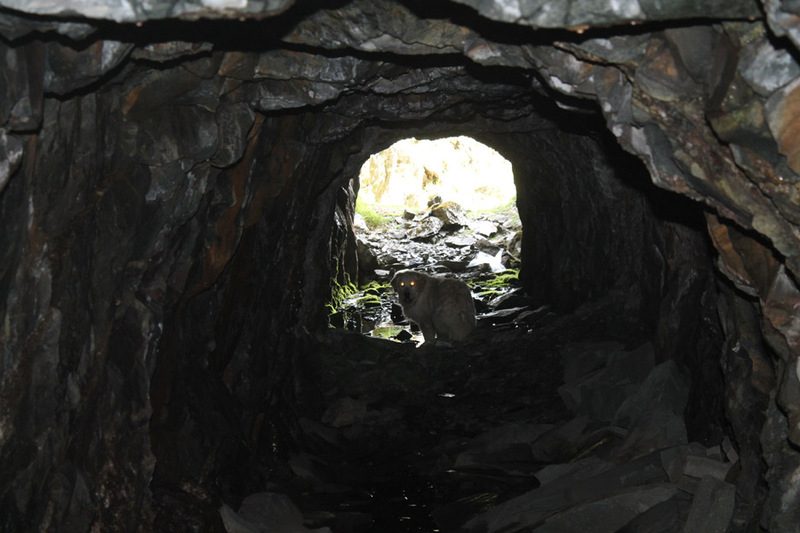 Beware monsters in the tunnel. A short underground tunnel and we're out into the sunshine again, looking down on more old workings. 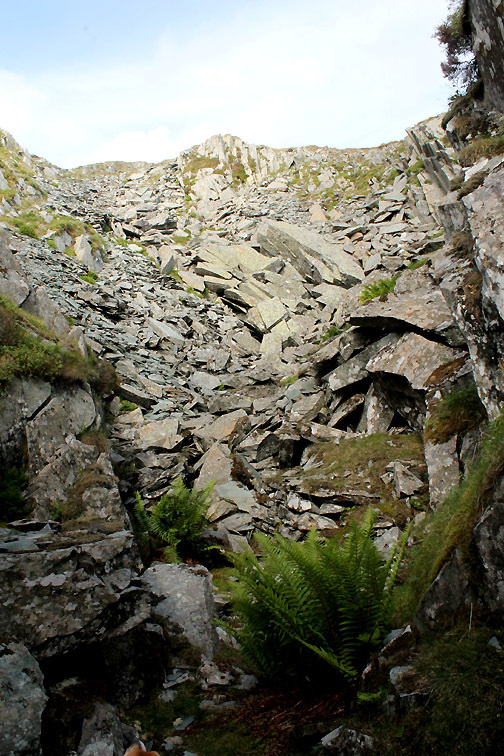 Cutting back left to the main track across the top of the Yew Crag mines and quarries. Outside the shop and cafe . 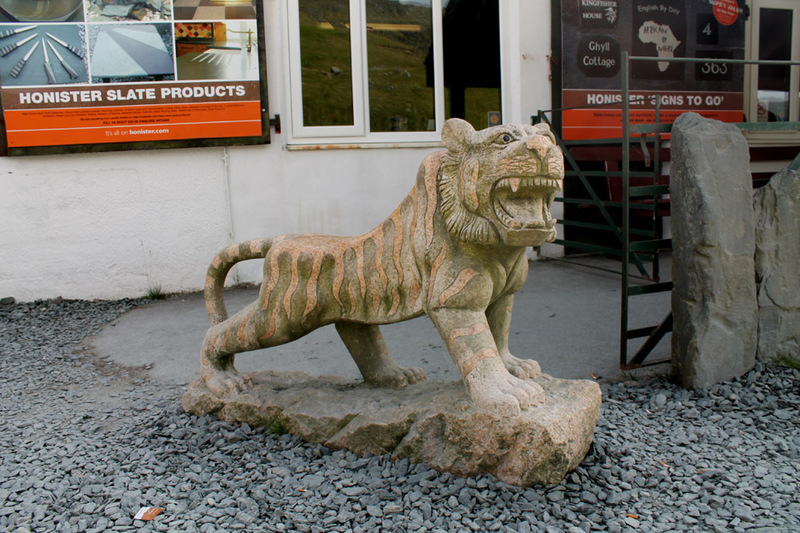 . . one of the Honister Tigers. 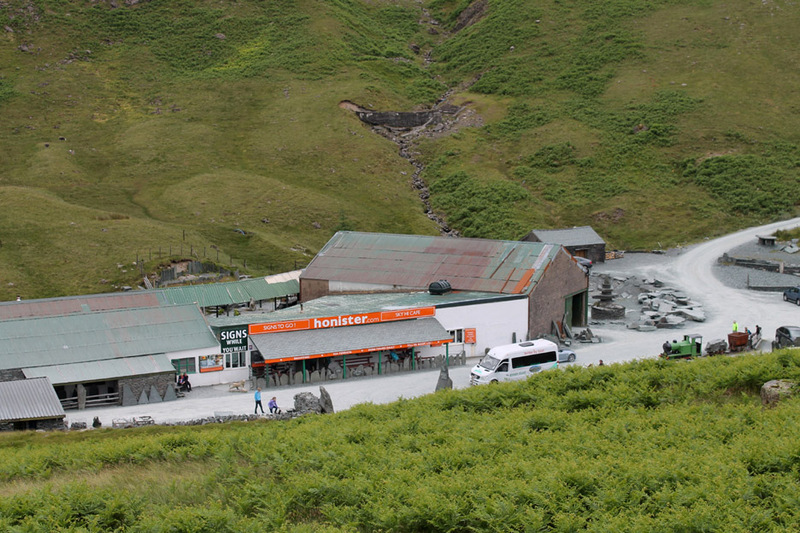 They will forever be a reminder of Mark Weir, the late owner of Honister, his business philosophy and in fact the way he lived his life. He once remarked that . . . " It is better to live like a tiger for a day than a mouse for life "
Mmmm . 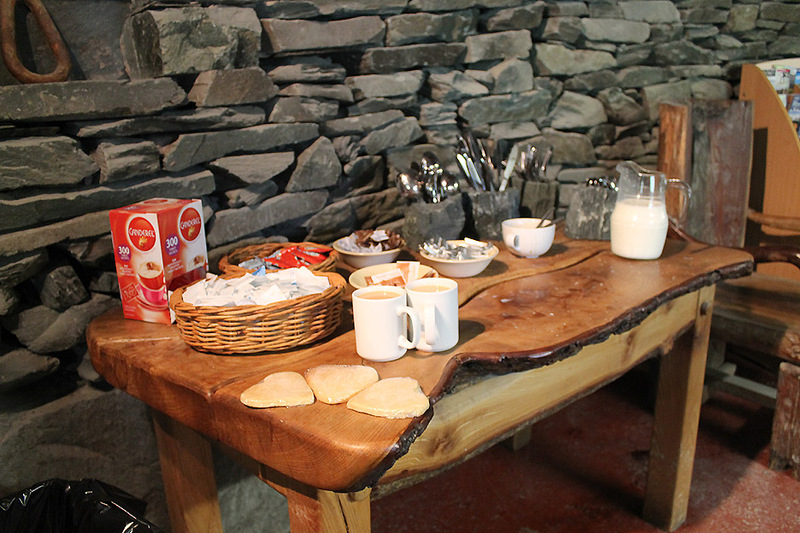 . . tea and shortbread from the Sky Hi Cafe after the walk . . . thanks Jo. While enjoying the brew outside, Amber was scared by that Tiger at the door . . . but then it did roar at her ! 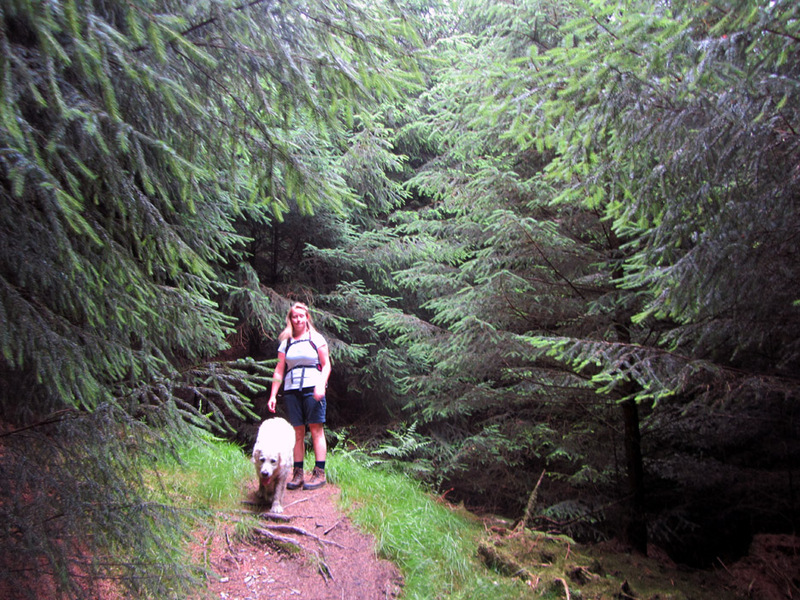 Next day Jen wanted another walk in order to get a little fitter for her Ben Nevis attempt next week. Revlin Moss car park this time . 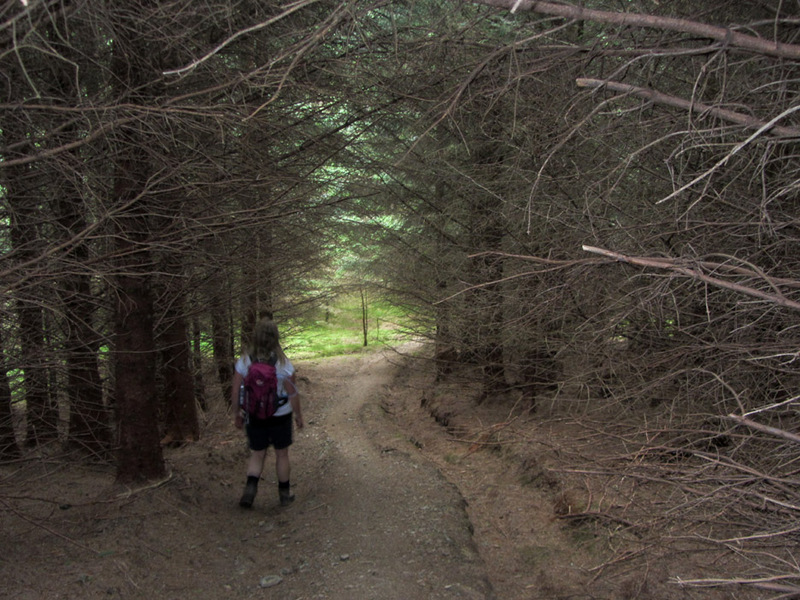 . . put some money in the forestry ticket machine and head off into the woods. Just Jen, Harry and I on this one. 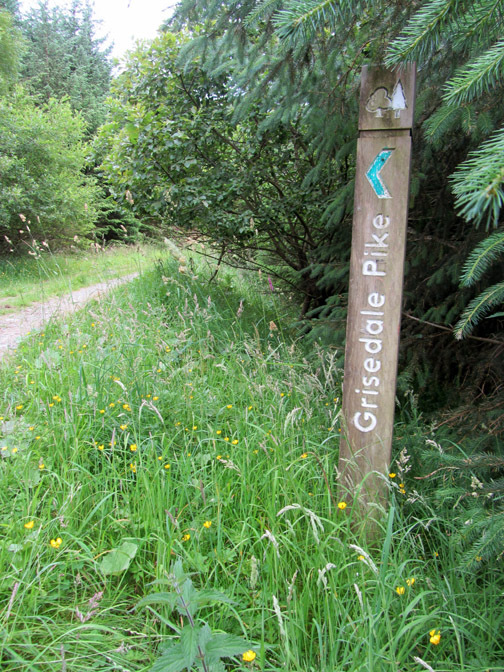 Through the forest tracks, turn left at the signpost. 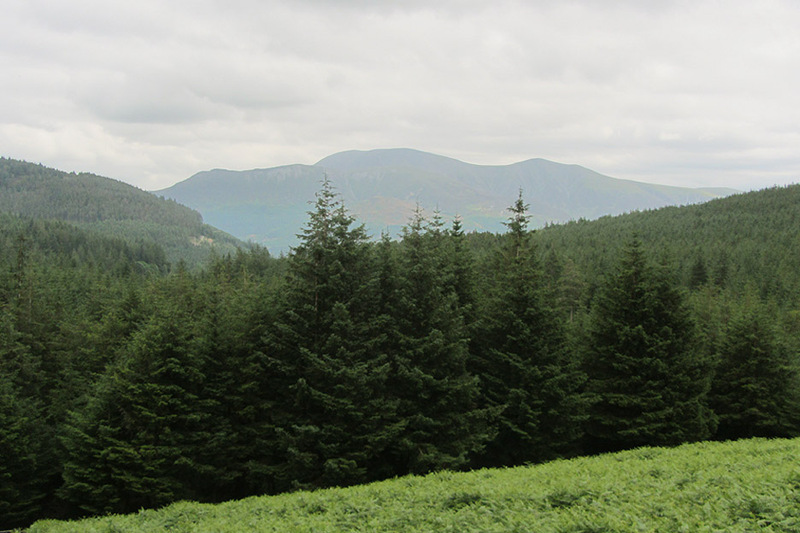 First views of Skiddaw as it emerges above the trees. More height . 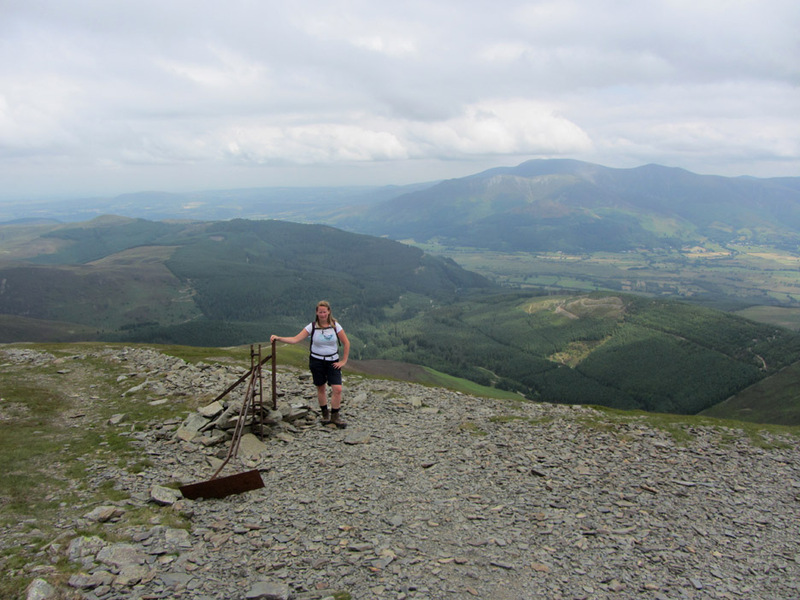 . . more Skiddaw (and a bit of Blencathra of course). but anyone know what this striking black and white moth is ? About an inch long with a hint of brown on the secondary wings. Best wishes to you all, Joan Bicknell. (Leamington Spa). * Hi Roger - I check your website virtually on a daily basis and thank you for the great pictures and info. 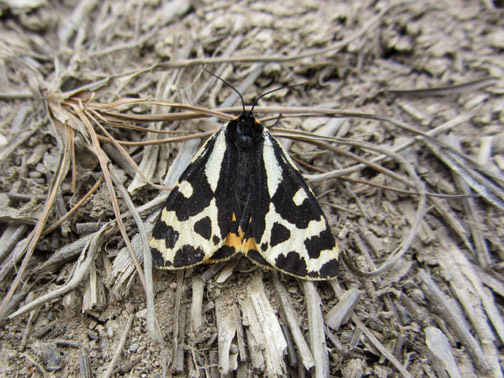 The moth you saw on your Grisedale Pike walk is a Wood Tiger moth (Parasenia plantaginis). 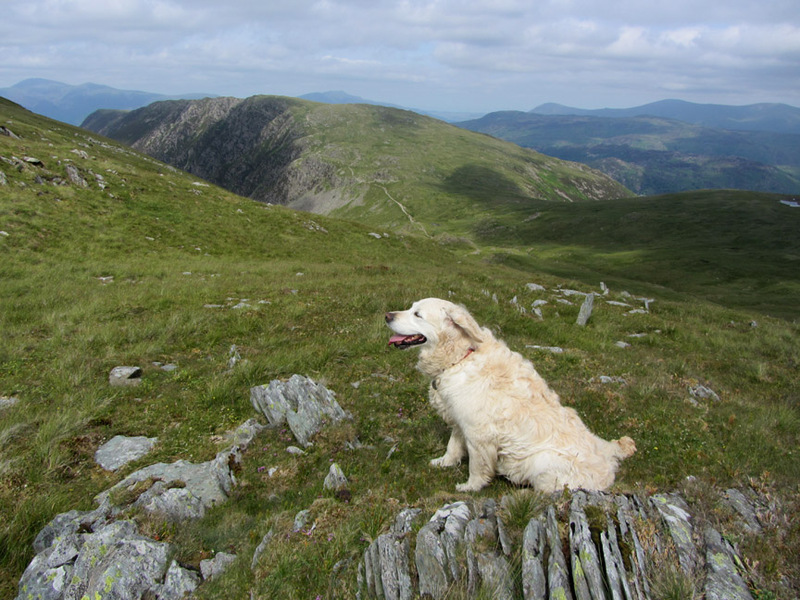 Keep up the good work - may catch you at work in Sept when we are next up in the Lakes. Best wishes - Steve (South Lincs). * Hi Roger - Looks like a Garden Tiger ... key it into Google images, colour patterns vary a great deal but the redness on the secondary wings is a clincher I think! Paul. * Hi Roger - I believe the moth is a Cream Spot Tiger Moth normally found in Southern England and South Wales http://www.animalphotos.me/moth-.htm. I use this site all the time. I hope it is helpful. All the best Steve Cater, Ashcombe Valley, Devon. to see pictures of all the Tiger Moths. on the Hants Moths site. The old wall guides us us up as we take our time in the humid weather. The view south over to green Causey Pike and on toward Langdale Pikes and Bowfell in the far distance. 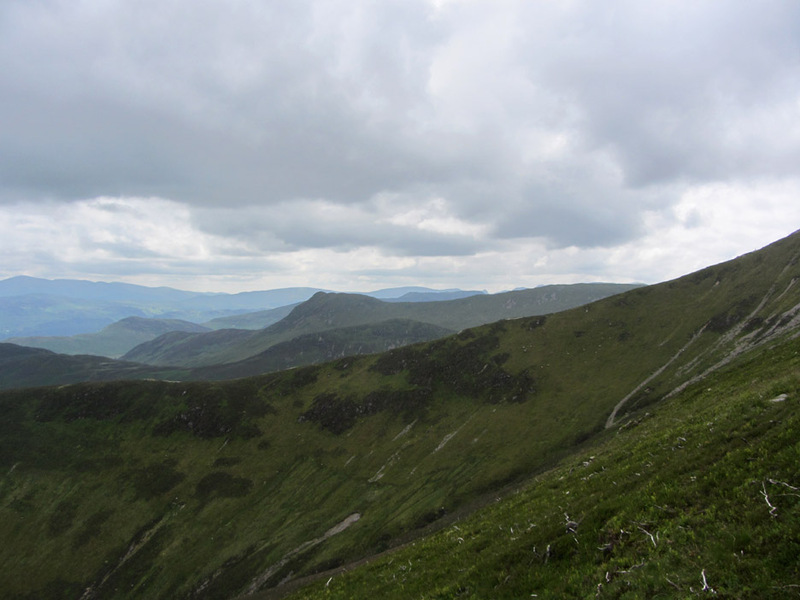 There are a few folk about, most of whom are climbing the ridge up from Kinn and Braithwaite. Harry spots a very small sheep close up . . . or a bigger sheep further away . . . perspective plays tricks occasionally ! 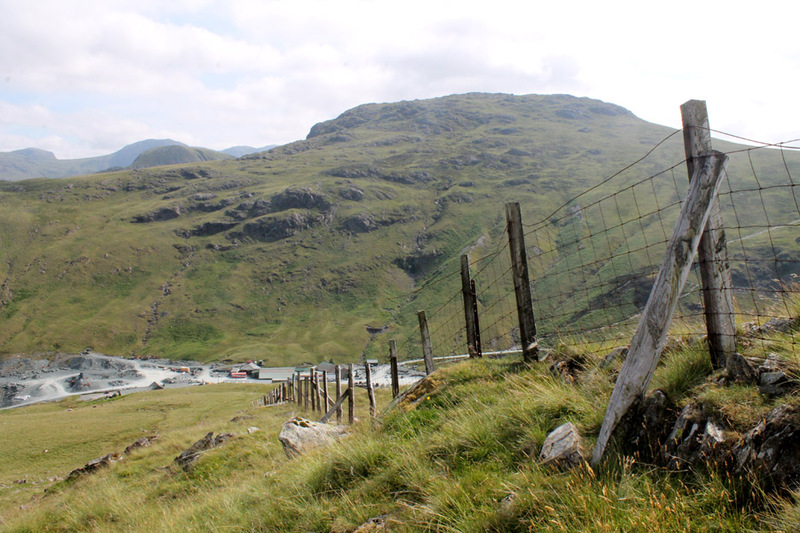 The last climb as the fence line takes a slight bend to follow the ridge line. Harry remembers something across the way that he found last time . . .
Is that a pause for a photo or pause for breath in the heat. It doesn't look it but the temperatures are still in the high twenties. If it gets windy up here . . .
. . . the old fence posts might make good handles to hold on to ! 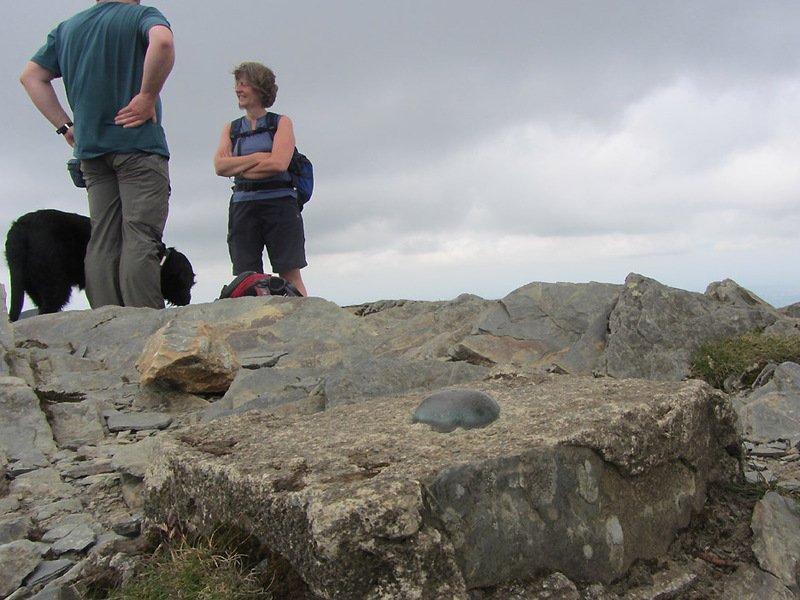 Those looking for a classic summit trig point will be disappointed . 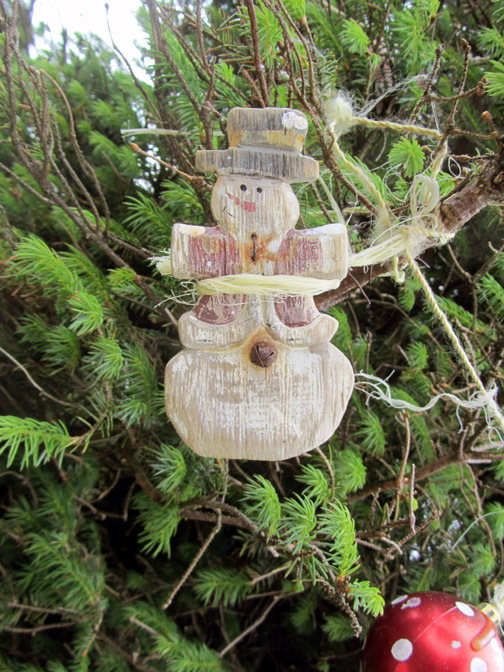 . . as I was by (photographically) chopping this chap's head off. We had a nice chat with this couple from Sheffield which is where Jen will be in college this next year. 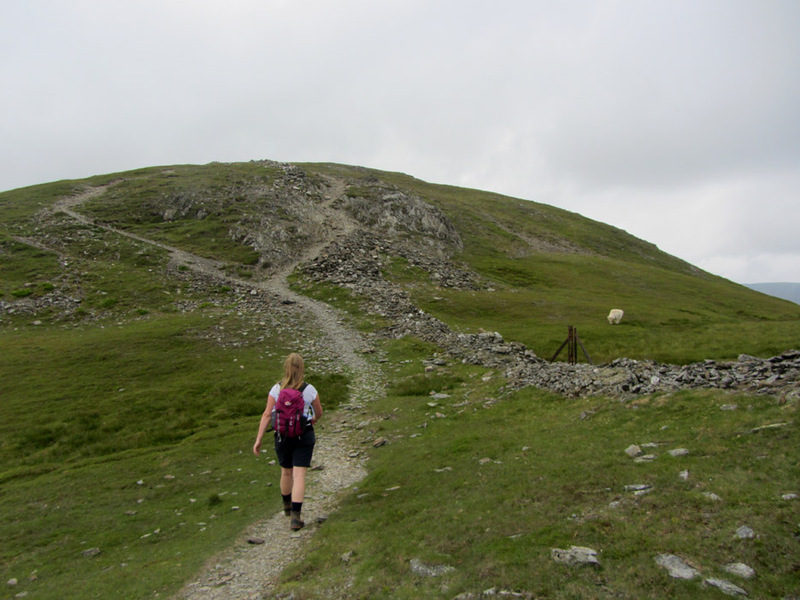 We pass on Hopegill Head as a walk that direction will take us down too far away from the car. Retracing our steps . 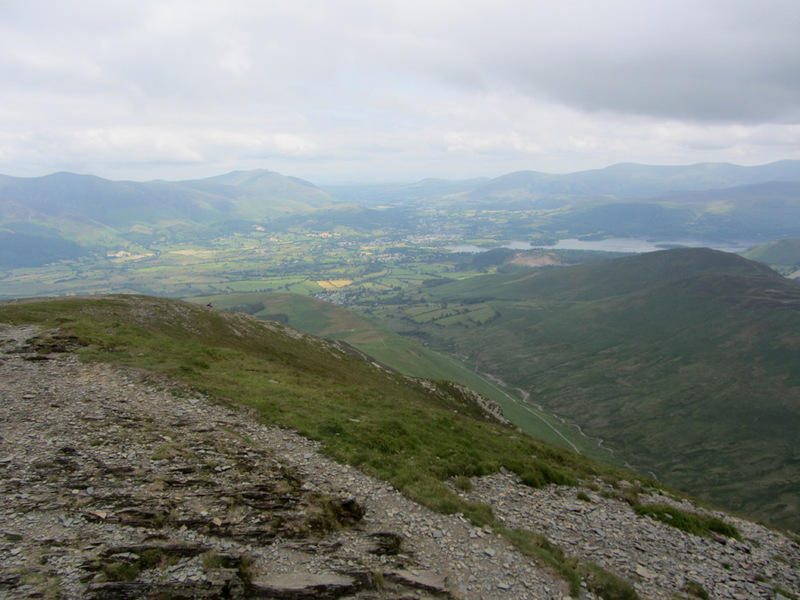 . . the view of Derwent Water and Keswick laid out before us. Looking across from the Hobcarton Ridge as we descend. The long, straight ascent we used from Revlin Moss is the next ridge across. 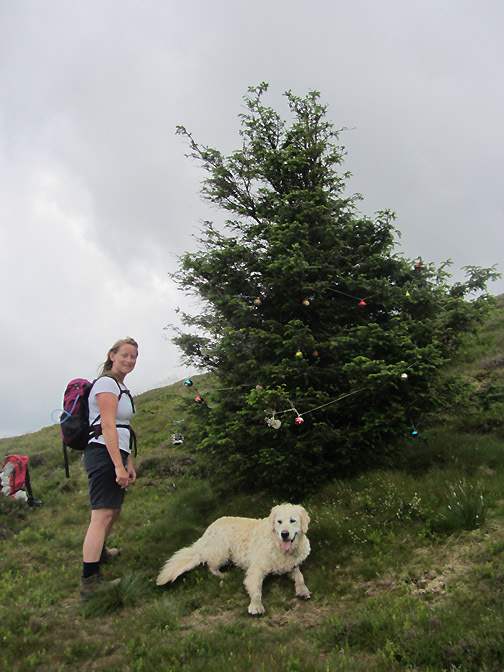 Jen had never been to the Christmas Tree before. 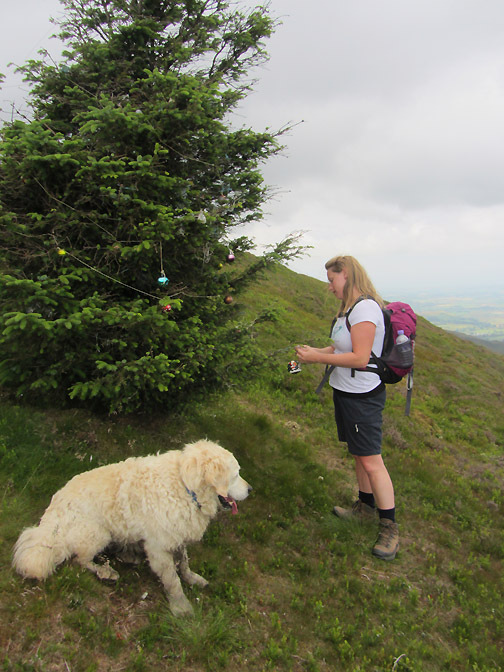 It is always Christmas at the highest tree on the fell. 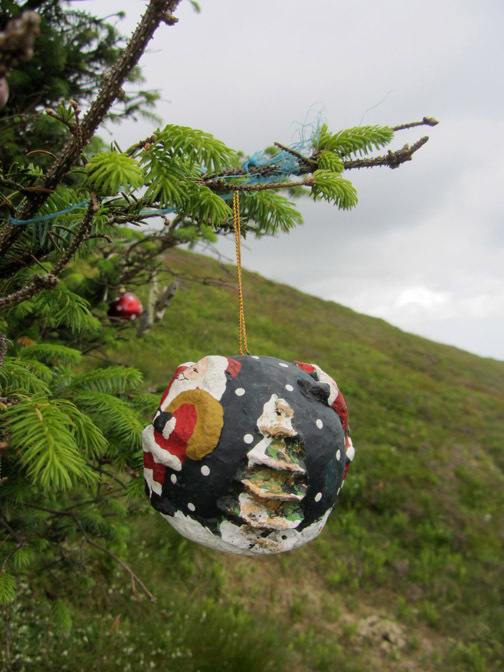 We added a bauble brought up in my rucksack. Do join in if you're passing this way. At the base of the descent the path heads into the trees. 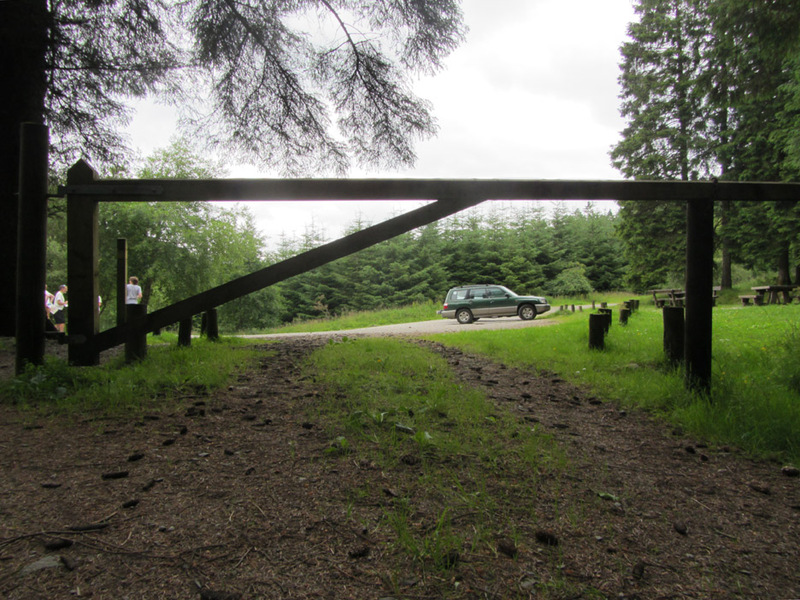 The car is parked back at the Revlin Moss car park . . . just a short distance away once we reach the light. This site best viewed with . . . A good lunch or breakfast before hand so no need to take sandwiches.